7 months after moving into my apartment I've finally purchased and placed the last piece of furniture to furnish it! This post originally was on my calendar to publish back in the spring when I moved to Dallas, but life happened and things took longer than expected. Furnishing my apartment has been such a fun thing because this is the first time I've lived alone and had a place I needed to furnish. Both my rentals in Vail came furnished which was great there because I knew I didn't want to live in Colorado forever. When I made the decision to move I listed the few furnishings I'd picked up on Craigslist for sale meaning I was able to start with a fresh canvas here. 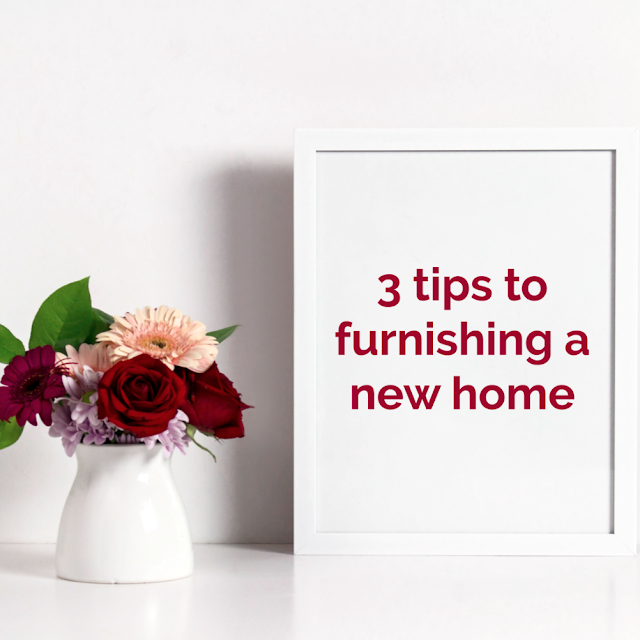 These 3 tips for furnishing a new home are helpful wether you're starting from scratch or just updating what you already have! 1. Have a budget and stick to it - Furniture is an investment, but that doesn't mean it has to break the bank. When I started furnishing my apartment the first thing I did was sit and really think about how much I wanted to spend, because let's be real I have champagne taste on a beer budget. The next step was prioritizing the most important pieces of furniture to decide where to spend the bulk of my budget. I decided the most important pieces for me were the mattress and couch as these were two items I knew I'd want to take with me and use for years to come. I obviously hope to use my tv stand and kitchen stools in my next home, but those are items where the size of the space plays a big role. Just because something is over budget doesn't mean you can't have it. I fell in love with this beautiful white dresser and almost didn't get it because it was more than I'd wanted to spend on that piece. I ultimately decided no other dresser was going to compare and it was worth it to skim the budget from other pieces so I could have this one piece I'd fallen in love with. 2. Have a realistic timeline and don't feel rushed - Admittedly 7 months was a bit longer than my timeline to furnish my apartment, but for me it worked. I bought the big things (bed, couch, coffee table) early but waited until I found pieces that really fit my look for everything else. The last item I purchased was a side table for my living room; I had moved with a table that was a little too big for the space but it did the job until I found a table that was perfect. Resist the urge to buy everything at once unless you're really in love with what you're seeing. Also don't feel bad about purchasing things our of order. I was convinced I had to purchase all my furniture before fun things like lamps and pillows, but I almost missed out on the perfect table lamp from Homegoods because I hadn't bought all my furniture first. Luckily I came to my senses and after not being able to get it out of my head for a week they still had one in stock when I went back to the store. 3. Do your research - There are so many places to buy furniture the options can easily get overwhelming. I suggest starting in a physical store where you can see things in person and get a feel for the style you like. From there go to online retailers like Overstock and Wayfair and search around. These sites let you set your budget and colors to help filter down what you're seeing. Look for links at the bottom of the page to similar items; often times you'll find something similar and less expensive. And always make sure to read the reviews! People will tell you the quality, if the color matches what's shown online, and how difficult it was to put together. What are your tips to furnishing a new home? these 3 ways to furnishing the home is best, none other can match this, thanks dude for sharing this with us.